Whatever your home phone needs, Ooma has the solution. Take Ooma to go with the mobile app. Make unlimited nationwide calls for free and international calls for next to nothing by tapping into your Ooma account on your smartphone. Ooma is compatible with iOS or Android mobile devices with wifi or data network access. As a Premier customer, you can also receive incoming calls on the Ooma mobile app. 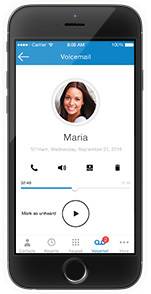 Never miss a call: The Ooma mobile app is linked to your Ooma account. If you’re an Ooma Premier subscriber, you can setup your app to ring whenever someone calls your Ooma number. Make unlimited calls: All Ooma subscribers enjoy unlimited domestic mobile app calling. Call overseas: Save up to 90% on international calls with our everyday low international rates. With the Ooma World Plan, make unlimited calls to over 60 countries for only CDN$ 17.99 a month. Access your account: Check voicemail and update your account preferences, all from within the app.